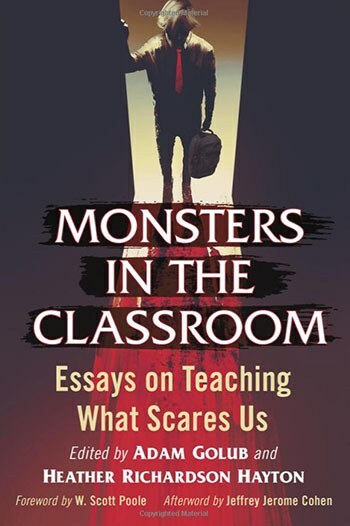 Monsters in the Classroom: Essays on Teaching What Scares Us, edited by Adam Golub and Heather Richardson Hayton, touches on some of the things that are wrong with education today, but the book primarily focuses on what’s oh so right. Monsters in the Classroom looks at ways educators (primarily at the college level but many of the ideas presented could be adapted for use at other levels, and one chapter focuses specifically on secondary education) incorporate monsters into their classes. From Frankenstein to King Kong to Buffy the Vampire Slayer, students in these classes examine texts, read critical theory, and make connections between these monsters and their own societies. Students study monsters in terms of space, religion, history, philosophy, politics, sexuality and gender. Students write papers, give presentations, make posters, take exams, and create and photograph “grotesque” scenes. In short, students learn. A lot. And they have fun doing it. So what’s the problem with monsters? The answer, according to Poole, seems to relate back to pop culture. Monsters have been around since the beginning of time, but for many academics they are too closely associated with pop culture, a culture that is often viewed by college professors and academics as a “mind-numbing, apolitical mass culture” or as something that is full of “mellow disengagement”. Studying monsters is nothing new, but creating entire classes around the theme of monsters (or the monstrous) is a little more unusual, particularly in disciplines like history and theater. And it’s always nice to see educators experimenting -- especially with things that involve staging overnight zombie apocalypses for first year students (which is something Professor Heather Richardson Hayden has done in several of her classes). This book is in and of itself an example of another wonderful thing happening in education today. The 12 educators who wrote chapters for this book share a great deal of their research and many also include full syllabi with reading lists and assignments. They do this so other educators can use these ideas to encourage deeper engagement with students in their own classes. The essays in this book primarily examine classes that focus completely on monsters, but the assignments could be easily adapted to coursework of which monsters are only a part. Additionally, assignments that are out of reach could be modified to be more attainable. All teachers might not be able to take their students, for example, on a walk through London (as Professor Kyle William Bishop does with his students) to find the actual locations Bram Stoker references in Dracula, but reading about this trip might give educators ideas for other types of activities. None of this would be possible without the generosity of the educators who created this book, and these educators, and others like them, should make us all optimistic about the future of education.